Like many others, the 2015 John Deere D125 Lawn Tractor (aka ride-on mower or garden tractor) has two annoying safety switches. One stalls the engine if you mow in reverse without pressing a button. The other stalls the engine as soon as you get off the seat (or lean too much forward or to one side). This post is about disabling/bypassing the (newer) seat safety switches. Unlike older models, the new seat safety switch now has four pins, and not just two wires, so things are a little bit more complicated than the ‘cut and short’ solution presented on many older YouTube videos. ‘Cut and short’ will not work on the newer safety switches. I conducted some research and found out that the switch itself is JD Part Number GY20073. It is available for next to nothing to people in the US, but the price increases by a factor of about 500% when you try to get it in Australia. Further research reveals that the (alternately-branded) Rotary 14246 Plunger Safety Switch is identical and much cheaper to source in Oz. What this tells us is that when no-one is sitting on the seat, the outer pair of pins are connected and so are the inner pair of pins, but when a person sits on the seat all of the pins are disconnected. This is surprising, as what it means is that to simulate a person sitting on the seat (the pin being pressed down) all you need to do is make sure none of the wires are connected — and that would be as easy as just unplugging the connector from the safety switch! This was such a surprise that I actually didn’t believe it. It doesn’t make sense to build a ‘safety’ switch that can just be unplugged by an end user. Closer examination of the switch with a magnifying glass revealed some imprinting: 63DH, DELTA SYSTEMS INC, STREETSBORO OHIO, US PAT NO 6,207,910. Examining the patent online made for a couple of hours of painstakingly slow but interesting reading. The patent for this switch describes it as a “low profile, two pole, plunger-type safety switch”. The electrical testing confirms two pole behaviour. 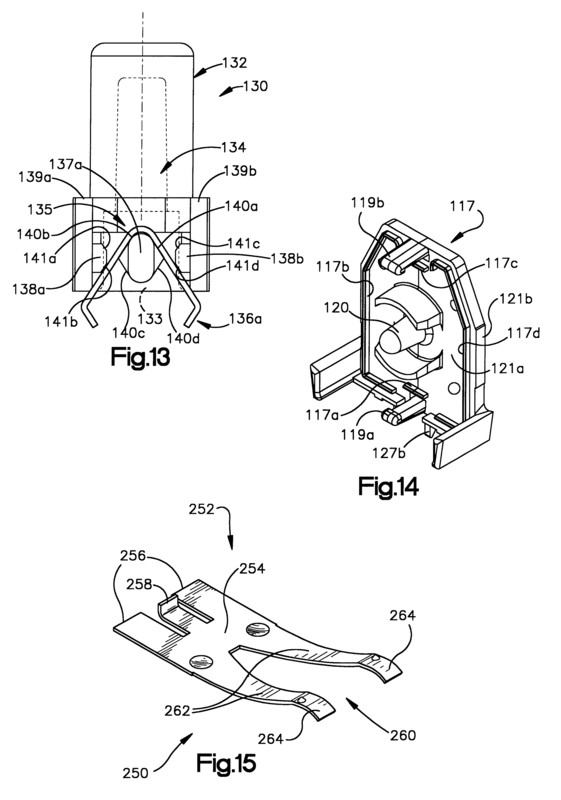 What was really interesting, however, is that the patent also includes the design of the connector — and the interaction between the two is where some clever engineering magic happens. As “it is desirable to prevent an operator from bypassing the operation of the safety functions provided by a seat mounted safety switch by simply disengaging the connector coupled to the switch housing” the engineers designed the connector to short-circuit the two middle wires in the connector itself when it was unplugged. Sneaky devils! So, what seems to be happening is that the two middle wires (2 and 3) are being used to make sure that the connector is actually connected to the switch and also sense the position of the pin. If 2-3 is closed circuit then either a) the connector has been unplugged, or b) the connector is plugged in but there is no-one on the seat (pin is up). In either of these cases the motor won’t run. If 2-3 is open then a) the connector must be plugged in and b) there should be someone on the seat (pin is down). The outer two wires (1 and 4) only sense the position of the pin. If 1-4 is closed-circuit then there is no-one on the seat (pin is up). If 1-4 is open circuit then someone’s on the seat (pin is down). It is thus almost certain that both 1-4 and 2-3 need to be open-circuit in order for the motor to run. The utterly trivial conclusion to all of this is that, in order to bypass the seat safety switch in your lawn tractor all you need to do is cut the cable before the connector. Simply cutting the cable and then insulating the exposed ends will ensure that no circuits are ever closed and therefore that all of them remain open — thus mimicking the electrical behaviour of the connector being plugged into the switch and the pin being pressed down. So, having done my homework and testing, it was now time to put the theory into practice. I had a few hours of mowing to do and a bit of spare time up my sleeve, so I pushed the lawn tractor out of the shed, tilted the seat forward and unceremoniously cut the wire all the way through with some snips. Brought the seat back down, hopped on the seat, applied the brake, pushed the throttle up to the choke position and turned the ignition key — the starter turned a few times and then the engine roared to life. I let the engine warm up for a while and then, with the motor idling, just hopped off the seat… and… nothing changed! The engine kept on running. Success! I then happily mowed for a few hours, hopping off frequently to open gates, move obstacles and pick up pieces of rubbish — and the engine kept running regardless of whether or not the mower deck was engaged or what revs it was pulling. Side note: On the JD D125 the seat safety switch wire that you cut is enclosed in a springy plastic sheath that runs down into a hole in the chassis of the tractor. When you tilt the seat forward this stretches and is thus under tension. When you cut through the wire the bottom part will probably withdraw down through the hole and quickly disappear from view. Don’t bother trying to fish through the hole with your fingers, pliers, or a wire. Kneel down next to the right, rear wheel and look just above and forward of the wheel — you will see the wire/sheath clamped to the frame. The part protruding up from the clamp will be the loose end you just cut. Use cable ties to secure this loose end somewhere so it won’t rub against anything metal or collect water. If you are particularly paranoid, or often drive your tractor through puddles, consider even taping or plugging the end with something to seal it. Remember that the wires in this loose end need to always remain open-circuit. If they are rubbing against metal parts or bridged with a droplet of muddy water, then they can close-circuit and — as far as the electronics of the engine are concerned — signal that the operator has left the seat and result in the engine stalling (or not starting). If the contact is intermittent (as it would be if vibrations were bouncing the wires against a metal part) then they could send conflicting signals multiple times per second to the engine which would result in erratic engine operation (symptoms similar to an engine being starved of fuel). Secure and/or seal the loose end to eliminate this problem from developing down the road. It is likely that many other brands of lawn tractors or garden tractors (e.g. Husqvarna, Sabre, Scotts) use a similar, if not identical switch and can be bypassed in the same way. I am neither young nor stupid. I’m never in a rush when I mow. I pay attention to where my feet are. My property is flat and the soil is sandy. The D125 comes to an automatic halt if you take your foot off the pedal. In my particular situation the negatives of a seat safety switch far outweigh the positives. Your circumstances are probably different. Use your brain. Safety switches exist to protect you in a variety of situations where things can go wrong. It is generally not a good idea to bypass them. If you are young and usually rushing to cut the grass on a sloping site with slippery clay soil with a mower that doesn’t automatically stop when you take your foot off, then you’d have to be insane to bypass the seat safety switch. Accept responsibility for your own actions and don’t blame others if you screw up. The reason why such a safety switch design is so effective actually involves psychology. The average person, when faced with an annoying safety switch, may simply try to unplug it. In their mind all the ‘clever stuff’ is being done by the switch itself. They think that by just unplugging the ‘dumb cable’ from the ‘clever bit’ they can stop the ‘clever stuff’ from happening. When this doesn’t work, they are probably a little bit surprised, then plug it back in and are just relieved that the tractor still fires up. Nothing broken — whew! The average person doesn’t have the technical knowledge or confidence to pursue the matter further. Based on a lifetime of prior experience, connectors are just dumb bits of plastic so there’s no way the connector could have anything to do with the tractor not starting up — they think that an unplugged cable behaves the same as a cut cable (i.e. no electricity goes anywhere). That means ‘the problem’ must be somewhere back in the engine bay itself and, well, that’s all just too hard. The simple strategy failed — give up. People with that mentality are probably the ones that designers are trying to protect from themselves — and rightly so. Those that do a bit of research, however, find that in order to effectively bypass the switch, they need to actually damage the machine (i.e. cut wires or, alternatively, rip out the shorting member with pliers). A lot of folks won’t be willing to do that because the idea of inflicting permanent, irreversible (in their minds) damage to something they paid money for is a mental obstacle too high for them to overcome. Since this issue is likely to arise when the machine is newly purchased, that makes it even harder. Deliberately damage a brand new tractor — are you crazy? By moving ‘intelligence’ from somewhere obvious (the switch) to somewhere obscure (the connector), the designers thwart the annoyed masses trying to bypass the seat safety switch. By making the only workaround one that causes damage, the designers further discourage those that are precious about their tractor. About the only folk left are the hackers who just don’t give a damn. If you’ve made it this far you’re probably one of those. I hope you found this post informative. Happy hacking! Posted in Stuff.Tagged bypass, disable, garden tractor, john deere, lawn tractor, ride-on mower, safety switch, seat. Actually you can fix the problem of the extra contact points by simply sticking two separate flat toothpicks in between the contact points below where the bottom two connectors plug into the switch. I did this to mine and it works great. Just leave it unplugged. This way you don’t need to cut the plug off and can return it to the functioning safety switch should you decide you need to or want to sell the tractor as originally designed. Thanks for all the “leg work” you did on this switch. You saved me a lot of time. Yep, there are a few less-destructive ways to do it. I have no resale plans for the lawn tractor and will never have a need for the safety switch, so a clean cut made the most sense for me. (In fact, when I do the next service I’ll probably trace the cable back to the engine bay and remove it completely.) I’m happy that the details provided saved you some time in developing your own solution — that’s the main reason I posted them. I don’t see the logic in multiple people worldwide having to research the same information. Happy mowing! I disconnected the plug on the switch, then with a pair of channel lock pliers squeezed the two plastic retainers on the switch and removed it from the seat. I zip tied the button in the down position. I positioned it down near the fuel filler and secure it another zip tie. Now I can reinstall it if needed. Ken, once you’ve zip-tied the pin down, is it possible to just put it back into position? I’m 430km from the tractor right now, but figure that if you can lock the pin down in such a way that it doesn’t mess with clearances, you could just re-attach it. the slot the switch sits in is a tight fit and there is not room for the zip ties. there is plenty of cable to just hide it in the fuel bay.besides if a problem would happen any distance away from your toolbox you can address it in the field. You clipped all 4 wires? Yep. I made sure the ignition was off and then just cut through the whole bundle. It was hard to believe that was all that needed to be done, but I’d conducted my research and testing and was 99.9% sure it would work… and it did. I very much enjoyed your description of this annoying problem. You sound like you really do know what you are talking about, so I went ahead and cut the wires. I will know in a couple of hours if this solves my problem or not. Its 5 am and just too early to start it up and check it. I am almost positive the wife would be a little more than up set if I disturb her beauty sleep. (God knows she needs more than she gets now). Heh heh. Experiments can wait — the little lady is always more important. Let us know how things go. Tim thanks for doing the research and sharing. And Rick, thanks for your response as well. I was simply trying to diagnose the problem so I could see if it indeed was the switch that was causing the issue. I could not find anything on the internet on how to test the switch itself. By using the toothpick approach, I can do just that. I used your remedy on my new D130 today and it worked perfect. Thank you so much for the information. Great article and it was very detailed. I also found everyone’s comment’s informative. Thanks, you saved me a lot of time. Do you have any other tips on your John Deere maintenance, give us a link or web page. I’m glad it saved you some time. I’ll be disabling the other safety switch some time in the future, and making a cage for the 17P cart, so will make additional posts when they happen. I currently have one other post about lawn tractor maintenance: Lawn Tractor Oil Filter Tips. About the only other thing I can suggest right now, if you have a cart, is to replace your hitch pin with something like a John Deere Magnetic Hitch Pin or Good Vibrations King Pin Lawn Mower Quick Connect Hitch Pin — they let you disconnect the cart from the lawn tractor with a single hand without having to bend over double or get on your knees to pull out or push in a cotter pin. A serious quality of life improvement for older folk or those with back issues. The Good Vibrations one is a bit long for the D125, so has a tendency to occasionally drag its tip and have it’s mechanism clogged up by long grass or dirt. I ran tape around the top of the shaft (near the handle) to act like a spacer, which increased the clearance between the tip of the pin and the ground, and greatly decreased the rate at which it clogs up. If you’re mowing your lawn on a regular basis, and keep the pin oiled, I think it’d be very, very reliable. No need to cut any wires. Inside the plastic connector is a metal clip that touches 2-3. Small screwdriver to pop it off. Done. easily reenabled by putting it back in the connector housing. Yep, I actually mentioned that approach in the Final Thoughts section. I personally prefer permanent solutions, and like ‘simplifying’ the machines I work with. Disabling “Nanny State” circuits is good, but completely removing them is better. I got a chance to do that on the last 50-hour service. 😉 Happy mowing! Glad I could help. The important thing is that you’ve got a working solution and now own a more user-friendly lawn tractor. Enjoy! I did the tooth pick fix and it worked, except for when I engage the mower deck it kills the engine. I have a 2016 model D160 John Deere and I was wondering if it uses a different switch? The D160 wasn’t on the model list I posted above. A quick search shows that the D160 (also the D170 and models upgraded with a High Back Lumbar Seat) use the AM130453 instead of the GY20073 so (at least at a product number level) they are different. Your experience would suggest that at least something has changed. How they are different electrically, I don’t know — I don’t have a D160 or an AM130453 to test. You could use the same process I detailed above (i.e. buy a spare switch and then test electrical continuity with the pin up and down) to work out what needs to be cut or shorted to effectively bypass an AM130453. You could also examine your switch for a patent number and check the patent online to see if they’ve done something sneaky with the connector — like they did with the GY20073. Thanks for the info. As I am electronically challenged, I’m not sure of my outcome. When you refer to pin up and pin down, are you speaking of the button on the seat switch? Correct — the pressure pin that is up when no-one is sitting on the seat, and down when someone is sitting on the seat. Thanks for this DIY hack. This particular model (LA110) only had 3 wires to the seat switch connector (4th wire looped back). I simply cut the 3 wires, kept isolated, re-wrapped them. The reverse switch bypass only req’d a loopback plug on 2 wire connector on the back of the dash-mounted push switch. Respect for safety first folks! Thanks for the feedback and I’m glad the approach worked for you! 2017 D155: The tooth pick trick works for the seat problem. Make the middle two connectors NOT make contact with the mini-flap in there. Yep, for folks that might (for whatever reason) want to re-enable the seat safety switch down the line, wedging the shorting member (imitating the interaction between 127a and 264 in Figures 11 and 12 above) and then zip-tying the loose cable somewhere is probably the best approach. Thank you so much, I have a new d125 and will try the tooth pick method as described above before cutting wires, also the reverse switch bypass will be implemented. Enjoyed your style. Thanks !! To all of you above for sharing your acquired knowledge and experiences. Last night my 1 month old D125 failed to start. I shorted the solenoid but no fire to the plug. Personally I need the switch to work because I am hardheaded and insist on mowing a ditch with mine; the ditch is rather steep and with the center of gravity being so high I want the safety factor. Also, my mower is under warranty and I don’t want to void it prematurely; but the nearest servicing dealer is 45 miles away and I need a way to test the circuits myself. I can replace whatever sensor or part is causing the issue cheaper than I can make two trips to the dealer – plus I need to mow the damn yard … again … Thanks to you guys I now have a plan !!!! My property is pretty flat, but some parts of my main mowing loop had ‘rough’ areas on them which introduced a little more tilt for the mower than I was comfortable with. I made notes of the locations, then used spoil from a pond excavation to level them out. Now there’s nothing to worry about at all. If your ditch is relatively small, and you don’t need to retain it, you might consider filling it in? Also, the annoying reverse over ride switch can simply be jumpered so you can mow in reverse. Did that before I ever engaged the blades the first time. It can be plugged back in should I need to take it to the dealer. My thoughts are that I’m a grown man who has been mowing grass without injury for 46 years. If I make a decision to over ride an idiot switch then that’s my prerogative and I bear the responsibility for the consequences – I don’t like strangulation by regulation !! Well said. The government sticks its nose into many places that it doesn’t belong. I don’t see a metal clip connecting terminals 2 and 3, and I’m not sure how a toothpick would be inserted to separate the contacts. Please clarify. Figure 15 (which you can see here) shows what the metal clip actually looks like. You can only see the curved ends of it (264) when it is viewed from the front. The location of part 262 on Figure 10 will show you where it is located if you look at the front of the connector. I didn’t use the toothpick approach, and I’m too far away from the lawn tractor to verify this, but when folks say “use a toothpick” I’m pretty sure they mean “take a toothpick, break it in half, and poke one half into each of the slots”. They don’t mean “use a single, unbroken, toothpick”. Looking at Figure 10, your goal is to stop part 262 from contacting the metal parts of 210b and 210c (i.e. the bottoms of the terminals marked as 212). In Figures 11 and 12 look at how parts 127a and 264/262 interact. The toothpick will perform the function of 127a (an electrically non-conducting nub) and push 264/262 down by wedging into the space above it. When the plug is disconnected, the arms of the clip (262) come into contact with the terminals (212) for both 210b and 210c — thereby closing the circuit between the middle pair of conductors and preventing operation of the engine. When the plug is connected, 127a pushes down on 264 so that 262 does not contact 212 — thereby opening the circuit between the middle pair of conductors and allowing the engine to operate normally (subject to the seat safety pin’s position, of course). Final note: I think it’s worth mentioning that circuits can be broken (opened) at any point along their length, so technically you don’t need to prevent contact between 262 and 212 at both 210b and 210c, you could just do one or the other. Sticking a single toothpick into only one of the slots will work. Unless you’re using really, really short toothpicks, however, it also means you’ll have a fair bit of toothpick sticking out of the connector. I’m not a fan of ‘bits sticking out’ as they are a source of failure, so snapping off the protruding end makes sense to me. That means breaking the toothpick. If you’re going to do that anyway, may as well just break the toothpick in half in the first place, stick half into each slot, and build some redundancy into your solution. Even if one of the toothpicks manages to fall or work its way out, you’ll still have the other one in there as a backup. Less chance of you happily riding along one day and then having your lawn tractor stall and then refuse to restart for absolutely no apparent reason whatsoever. I read all of this and was about to remove the jumper wire in the plug because it would do the same thing as cutting it. Just for giggles I tried starting it with it the switch unplugged and it worked. I didn’t have to cut anything or remove the jumper wire. I just left it unplugged. I have a 2017 John Deere D140. Since it takes only a couple of minutes to test, unplugging the seat safety switch is the very first thing everyone should try if they find themselves travelling down this path. It’s hard to believe that any decent safety switch can be bypassed by simply unplugging it, but you’ve got nothing to lose and aren’t going to cause any damage, so why not give it a go? Assuming your 2017 D140 is not some sort of freak, maybe JD have rolled back to a simpler, cheaper safety switch design? Something that still allows them to tick the box saying they have a seat safety switch installed (thus warding off the lawyers), whilst not being encumbered by the additional cost of a tamper-resistant design? Thanks for the clarification, Tim. I took another look at the connector (with a magnifying glass) and found the metal clip and pulled it out. Problem solved. The diagrams and your explanation do make sense. I just couldn’t see the metal clip the first time. Thanks again. What year was your D125 built? See Figure 11 above and look for the piece marked 264. It’s in the piece of plastic connected to the cable that goes to your engine. Given that the pins are on the seat safety switch, that technically means that the plug/connector is female. Interesting behaviour on your L105. Behaves more like a RIO switch. My boyfriend just purchased a John Deere 130 series lawn tractor . I have just one question will the mower blades keep working ? He wants the blades to still keep engaged also . Nanny-state legislation mandates that all lawn tractors/ride-on mowers have safety devices installed to shut down the engine if the ‘operator leaves the seat’ so yes, a new D130 will have that ‘feature’. He will need to find a way to bypass the seat safety switch if he doesn’t want the engine to stop. Whether or not the mower deck is engaged or not doesn’t really matter — if the operator is not in the seat then legally there is no-one in control of the machine and (so the ‘logic’ goes) it should cease operation completely. I wonder if your LA120 and Brian’s L105 actually have a different type of seat safety switch and/or connector? Does the one you have installed match the image at the top of this article? Great article. Any help with three wire safety seat switch on older craftsman mower? I’ve never had one of the three-wire seat safety switches, or a Craftsman, so I can’t give you any advice from direct, personal experience. That said, the current generation (and all previous generations) of seat safety switches all implement simple electrical circuits. Thus they can all be bypassed relatively easily. The process described in this article can be used by anyone to work out a way to bypass a given switch — regardless of the number of pins or wires, or the cleverness of any connectors. I advise following the same process: 1) Probe the switch with a multimeter to reveal the continuity states. 2) Track down the patent that applies to your switch and see if they’ve been sneaky with the connector. Based on the results you get from doing those two steps, one or more bypass solutions should present themselves. Thanks so much for doing the hard work for me on this. I just took care of mine with a cut credit card stuck in the connector. I also did the mow in reverse button with a jumper. Good to hear your hack worked. Credit cards, tooth picks, pulling bits out with pliers, cutting the cable before the connector… all will achieve the desired result. At the end of the day, you just need to unplug the connector from the switch and stop the middle two wires from coming into contact with each other. The Reverse Implement Option (RIO) button — that shuts down the engine if you try to reverse whilst the mower deck is engaged — has always (as far as I can tell) been able to be bypassed by simply shorting both wires. Not advisable if you have young kids/pets who don’t know that being behind a lawn tractor is an extremely bad place to be (as that child in Ontario found out in 2016)… but if that’s not the case and you frequently need to back up for a bit, then it’s also a great 5-minute hack. Outstanding tip. I opted to use a zip tie but love reading the patent. Very clever. Glad you liked it. This is the first time I’ve come across an intelligent connector, so I was impressed by the design as well. Elegant but effective. Devious minds must have spent quite some time coming up with it. I replaced the fuel filter during my last (50h) service. It was about 90% full of petrol but had an air pocket taking up the remaining 10%. A small amount of air is normal and nothing to worry about. If the air pocket gets too large then some will get drawn into the line and end up in the cylinder where it will do absolutely nothing except result in one or two strokes with lower pressure/power. If your engine is always running rough, and it frequently loses power, then sure, closely check the fuel filter. If it’s mostly full of air then you may have a leak in the line that goes towards the fuel tank. Also inspect the line that connects the filter to the engine for leaks. A small leak in the fuel lines won’t result in sudden cut-outs though. You need to have the fuel completely missing or blocked for that to happen. I usually suspect the electrical system when troubleshooting that type of problem (and check for tight and clean connections to battery terminals first and foremost). Troubleshooting cut-out problems is beyond the scope of this article, to be sure, but thought I’d respond anyway, since you asked. Excellent research and great article. You saved me all the time of pinning it out to see how they were avoiding my simple unplugging. Thanks, and I’m glad I managed to save you some time. Happy mowing! The end of the story is to simply disconnect and then cut off the tractor’s side of electric connector under seat. You don’t even need to disconnect the connector from the switch — just cut the cable and secure the loose end. I have a new Kubota with the seat switch that looks identical to this switch and wonder if the same fix would apply. If the switch is identical then the same fix should work. You would want to put in a bit of legwork to make sure that’s the case, though. Physically removing the switch and checking the patent/part number is probably the fastest way to go (assuming it can be removed, of course). Alternatively, if you have a manual that lists all of the parts, you could refer to that. Or Kubota’s website/webstore might have a way for you to input your model and year and then return a list of all spare parts that can be purchased for that lawn tractor. Calling the service department of your nearest Kubota dealer and asking a human is another approach. So is a web search for something like “[make] [model] [year] seat safety switch part number”. Regardless of how you get the patent/part number, a bit of online research will then ascertain whether or not it’s the same and answer your question. D160 Solution Confirmed: I have a brand new D160 and the toothpick solution works perfectly. Round toothpicks work better than flat which I suspect may vibrate loose. The sharp point of the round pick makes it easy to separate the closed contacts on pins 2 & 3 and when pushed all the way in the round barrel jams in tight at the connector. Cut off the excess toothpick and tie wrap the unplugged connector and you’re done. Thanks Rick, and great job Tim with the research. Thanks for the feedback Gary — happy mowing! I purchased the same switch to try on my Kubota z411 and found the normally off/on were reversed so I just plugged it into my harness and locked it in the OFF position and it worked perfectly. I kept the original switch in the seat so it can be re-installed in case of warranty. Good thinking Dennis! I’d love to get a zero-turn mower (like the Z411) one day but other things have priority right now. Happy mowing! Many thanks for the tip on the plug. I’m using my L118 mower to gas gophers via a hose from the muffler, so want it to stay running when I’m not in the seat. I’m a life time farmer so not going to do anything stupid like leave the mower blades on while off the tractor or back over a pet or kid, don’t have any. Mine ran by just unplugging it, but I already had bypassed the reverse button. I found it died when engaging the mower however, and removed those two contacts, now it’s running in all modes. When I read “gas gophers via a hose from the muffler” I thought you were into some pretty questionable refuelling practices on a golf course or something, but then I worked out what you meant. Caddyshack must have short-circuited my brain. Have fun! I’ve had the seat switch tie wrapped down for years on my10 yr old L115. After setting for several months I started it. It rain for several moments and shut off. This happened twice and now it just turns over but doesn’t fire. I’ve cut the wires to the 3-wire seat switch and cleaned the spark plug but there is still no spark to the engine. Any suggestions? I’m not sure why you cut the wires to the seat safety switch. I also don’t know if your 3-wire system can actually be bypassed by simply cutting the cable. (A lot of the older ones need to be shorted, not cut.) Your problem might have nothing at all to do with the seat safety switch. If a lawn tractor stalls — or fails to start — when it gets wet, then I’d suspect that water is getting somewhere it’s not supposed to be. You could have water in your fuel tank/lines. You could have water in your electrical system somewhere. Your petrol could have gone bad. If I were you I’d reconnect the seat safety switch and restore things back the way they were before. I’d also store the tractor somewhere like a shed where it can dry out for a few days. I’d visually examine the fuel filter to see if a layer of water is visible in it. Once the tractor is dry, and on a dry day, I’d try to start it up. If I could get it to start up, then I’d drive it out onto the lawn and grab a garden hose. I’d then simulate rain by spraying the front of the machine (steering wheel forward) with water for 10-15 minutes. Really drench it. If the engine stalls, I’d know the problem is on the front half of the machine. If it doesn’t stall, I’d drench the rear of the machine for 10-15 minutes. If the engine stalls, I’d know the problem is on the rear half of the machine. That said, if you actually had a pile of bricks on the seat, had the engine cover up, had the spark plug removed, and were grounding the plug to the block at the same time as you cranked the engine, and still didn’t manage to see a spark… then that would have suggested an electrical rather than fuel problem. Could be a bad ignition module, faulty spark plug boot or leads, or a pile of other things. B. Never make a modification that you can’t reverse while trouble shooting unexpected problems. Let’s assume you have an ignition problem due to water penetration, and further, that cutting the seat wires disables the ignition system. For this example you have inadvertently created an irreparable situation for all but the most experienced trouble-shooter. Suggest following Tim’s advice step by step in the order presented. Avoid making more than one change at a time. I appreciate the detail of your post. I recently purchased a used 2006/7 John Deere 135 to replace a 115 model that died on me. The 135 had both the RIO and seat cut-off switches engaged. The seat switch on that model is similar to the one you described, but like a few other people have said it has a switch with only 3 wires in and a loop in the switch. I followed a similar fix to the toothpick solutions, but I used a piece of paper (a business card) cut to slide in between the middle part of the safety switch plug; pins 2 and 3. I slid the paper between the terminals so the current was permanently interrupted. The key is to NOT reattach the plug. Many videos and other posts don’t mention that part. I then zip tied the connector to the seat bracket. This solution for the older 135 model takes about two minutes to complete and it can be reversed in 20 seconds by removing the paper and reattaching the connector. The RIO switch bypass that I used was simple as well. I made a little jumper wire by attaching two male wire connectors to the ends of a two-inch piece of 16 gauge wire. I then unplugged the RIO switch connector and plugged the jumper into the female part of the connector and zip tied the plug to the wire bundle in that area of the engine bay. The mower is tricked into thinking the RIO switch is depressed at all times. I can now jump off the mower and reverse without doing anything. Both of these bypass solutions can be reversed with almost no effort to return the mower to the original specs. Thanks for your comment Martin — especially the details of your experience bypassing a 3-wire seat safety switch. I suspect that your connector would be using a ‘common ground’ to make that work, but since mine was a 4-wire I can’t check. In any case, you’ve provided a valuable data point that can inspire other 3-wire owners to try disabling their safety switches in a reversible fashion to see if their system works (and can be disabled) the same way as 4-wire systems. Oh, and nice use of a business card! Depending on how wet your environment may be, a regular paper business card might eventually get moist enough to start shorting. Business cards that have a thin plastic film on the top should’t have the same issue. In the same vein, cutting a strip off an old/unused plastic credit/debit/store card should work just fine. Leave it to the wonks from OZ to figure that one out! I’m impressed! I couldn’t make the toothpick plan work but by putting the toothpick on the outside of the pin I was able to easily remove the pin entirely, and a little shrink tubing will keep it insulated. That worked like a charm. I have a D155 and tried to buy a seat switch from Green and they told me they couldn’t find the correct seat switch part number for it.